Christmas came round ever so quickly this year, in fact far too quickly for my liking. I have no idea where this past year has gone. It doesn't seem that long ago that I was expecting Harry and was around 38 weeks, gasping for a sip of baileys and now Harry is 11 months and it was his first Christmas and my first as a single parent. Previous years I have always been really organised and had the majority of my presents bought and wrapped by December along with stockings and Christmas Eve baskets all ready to go however for some reason this year I left it all till the last minute. I'm not sure if it was because Amelia was at School and I went back to work after being on maternity leave and I didn't have as much time on my hands compared to previous years, but I wasn't really motivated to do it all. I was really looking forward to Christmas this year, Harry's first and Amelia's fourth however was a little worried how it would pan out, however I had nothing to worry about as it was a lovely Christmas and no different than any other year other than Harry being here and Amelia actually understanding it more which was nice. Andy dropped the kids home on Christmas Eve morning as I'd been working the previous night and he needed to do a couple of things at work. Amelia and I made a gingerbread house before Andy came round to stay on Christmas Eve to spend Christmas with us and then we all went over to his parents on Boxing day like we do every year. Amelia woke up at 8.30 on Christmas morning so we got a mini lie in and went downstairs to find that Santa had eaten his mince pie, cookies and drank his milk and the reindeer had eaten his carrot. Amelia was also thrilled to see Santas footprints too. We both really enjoyed this part of Christmas this year, getting everything ready the night before and watching Amelia put them out for Santa and seeing her reaction in the morning. The next thing she spotted was her bike and she ran over to it so excited and ecstatic shouting "my bike, thank you Santa, thank you for my bike" before getting on it and riding it around the living room. Both of the kids were very lucky this year and received some lovely presents from Santa and relatives. 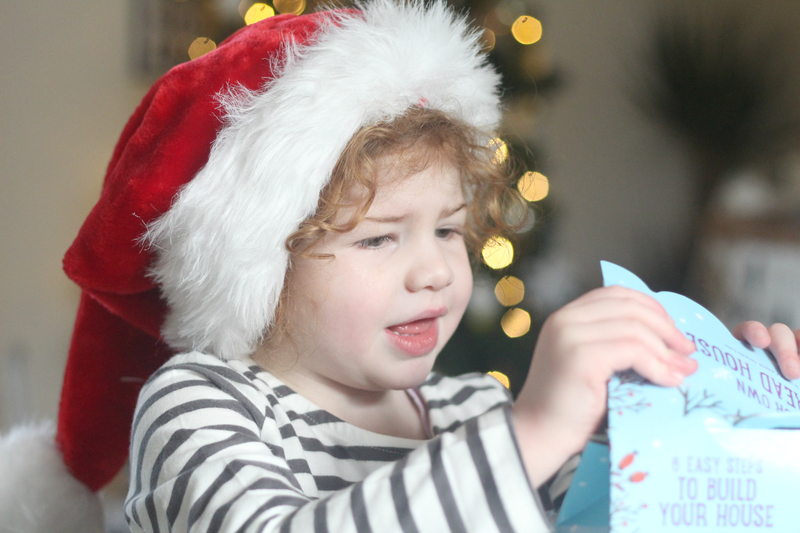 Santa bought Amelia a Frozen bike and some Barbies which she had been asking for as well as a Frozen scooter, lots of Frozen dolls, Peppa pig toys and some other disney dolls. Harry got a lovely activity table, some wooden toys and interactive toys. After opening all of her presents from Santa, stocking and a few from some family members it was half past ten and Harry was still sleeping so we decided to wake him up so he could join in the fun. He has been poorly in the run up to Christmas so we thought it was best to let him sleep in. 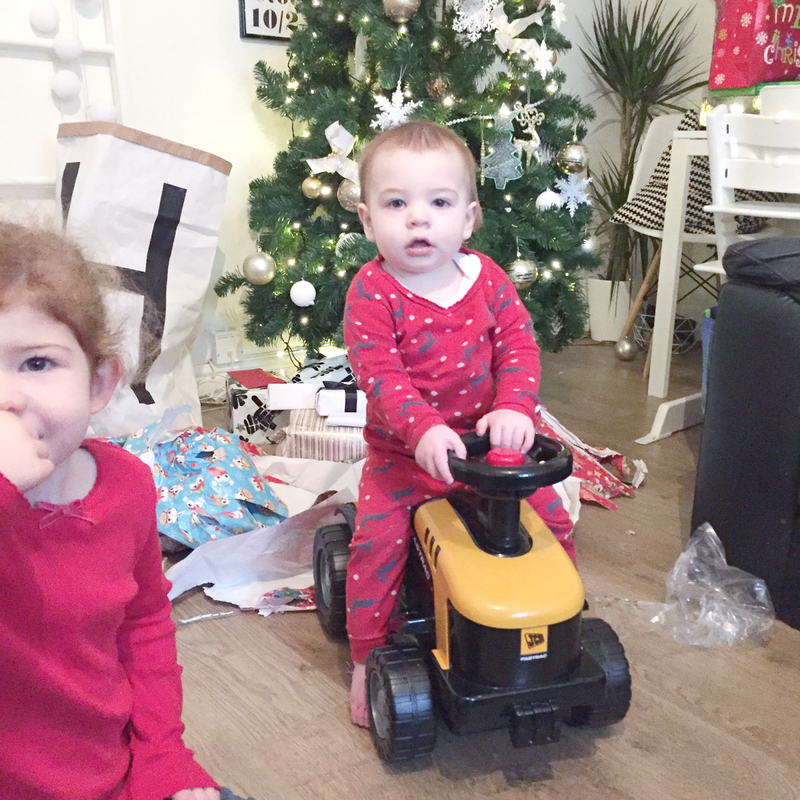 Amelia loved helping him open his presents, of course he was more interested in everything else but his presents, but he did take to a few of them especially his JCB. My family came over shortly after and we all exchanged presents and the kids played with their presents before leaving us to have dinner. We then spent the rest of the afternoon playing with more toys, stuffing our faces with chocolate and watching Christmas films. The day seemed to fly by this year, which was a shame as I love to enjoy the day and like it to go slowly so I can take it all in. Once the kids were both tucked up in bed we watched the soaps and a couple of new DVDs we'd received for Christmas and hit the sack in the early hours of the morning. It was such an enjoyable day and was lovely to spend it all together even though we're no longer together there's no reason why we can't spend it as a family, after all we still get on really well and wanted to keep it as normal as possible for the kids. Now I'm desperately wanting to take the tree down to make room for all of the kids toy and get the house tidy and organised for the new year. I always like starting the new year fresh. I also have Harrys birthday to prepare for next month! I hope you all had a lovely Christmas with your families. Love the photos Kerry. Beryl professional. Sounds like you had a lovely christmas. Harry is a lazy little lump sleeping in. Lol I would have loved to get chloe an activity table but it takes up so much space. Sincerely we didn t have Christmas this year! I spent the night with a candle, my both sons works on the other side of the sea . One in the military service(Finland) the other in Paris, my man works the night, my parents in Finland too..
yes, it was really sad. But I ove your XMas and the beautiful pictures you re sharing! 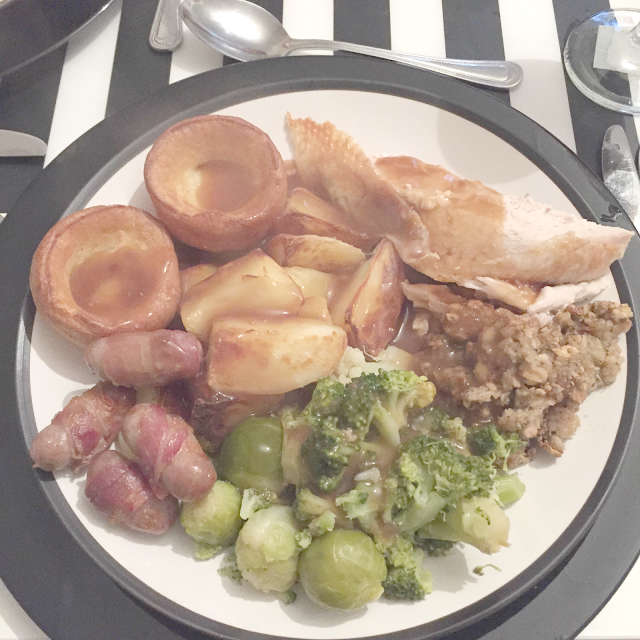 Lovely photos Kerry, sounds like you had a great Christmas! I think it's great that you still spent it as a family, even though you're not together any more! Makes it so nice for Amelia and Harry!